Turcas directly owns 5% of ATAŞ Refinery, which started up operations in 1962 in Mersin. Currently, Turcas’ partners in ATAŞ are BP (68%) and Shell & Turcas Petrol (27%). As a result of investments realized after the decision to close down ATAŞ Refinery and transform it into a large-scale oil products terminal on the Mediterranean coast in 2004, ATAŞ Terminal today serves as a licensed storage facility. The terminal has an oil products storage capacity of 570,000 m3 as well as its own pier, where high-capacity ships can dock. Some 32% of ATAŞ’s total storage capacity, cumulatively owned by Shell & Turcas Petrol (27%) and Turcas (5%), has been allocated for Shell & Turcas Petrol’s use. As a result of negotiations between Shell & Turcas Petrol A.Ş. and Shell Group, Shell & Turcas Petrol A.Ş. acquired 27% of the shares of ATAŞ owned by The Shell Petroleum Company Ltd. (“SPC,” one of Shell Group companies) and 27% of the shares of ATAŞ storage facilities owned by Raffinaderij Shell Mersin N.V. (“RSM”) on December 30, 2016, together with liabilities arising from the agreement, for a total consideration of TL 30 million. As a result of this transaction, on top of Turcas’ 5% direct shareholding in ATAŞ and its storage facilities, the Company added an indirect shareholding of 8.1% (27%*30%), via Turcas’ 30% shareholding in STAŞ. 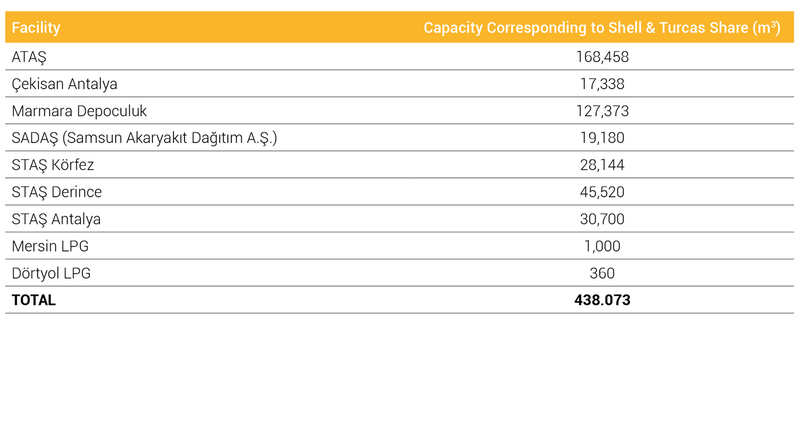 Shell & Turcas’ total fuel storage capacities in Turkey, including ATAŞ, are presented in the table below.